Stratasys is promising something big on their May 8, 2012, 10am CT announcement. Two weeks ago, 3D printer companies Stratasys and Objet Merged into Largest 3D Printer Company in the world, pushing 3D Systems into the #2 position in terms of market capitalization. Stratasys (SSYS) stock jumped from the low 30’s to the low 50’s. But, now what is Stratasys up to? 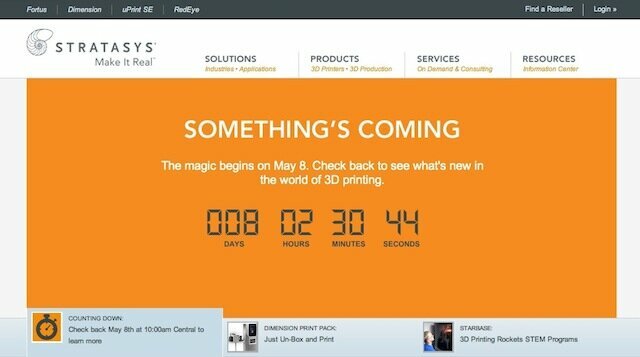 If you go to the Stratasys website, you will see a rotating banner with a countdown timer that says, “Something’s Coming. The magic begins on May 8. Check back to see what’s new in the world of 3D printing.” Now what on earth could this be? The May 8 date is interesting. The following day, May 9, the company will be announcing its financial results for the first quarter of 2012 and be holding a conference call (listen to it here) with investors. Generally, big financial news is not announced just prior to an earnings release, since it makes a company’s stock too volatile that day. But they are doing just that — there will be a nearly a full day of trading after the news is released at 10:00 AM central time, and before the market closes, awaiting the next morning’s earnings release. So, it’s not going to be a merger, buy out, or other form of financial news. That means it’s likely a product announcement of some sort. But, there is something else happening on May 8. That’s when Stratasys opens their booth at the Mfg4 – Manufacturing for the Future conference in Hartford, CT, which runs through May 10. This world-class event and conference brings together the aerospace, defense (including arms), medical and energy industries, and is produced by The Society of Manufacturing Engineers (SME). Hmmm. So, it’s a big mystery, just as Stratasys intended. And it worked. It’s got me really curious. Curious enough to write this post. Kudos to the marketing department. If anyone has any info, or wants to venture any guesses, post it in the comments below.